There is still a large amount of stigma surrounding mental health today… but for some reason when it comes to male mental health the stigma increases. Despite the fact that women are more likely to be diagnosed with common mental health conditions such as Depression, Anxiety, Obsessive Compulsive Disorder, and Panic Disorders, there are still important indicators that there is widespread mental distress in men. It is estimated the 12.5% of men in the UK alone have a common mental disorder, although this statistic is believed to be much higher as there are many men out there who have not sought help for their illnesses. In a survey that took place in 2016, run by Men’s Health Forum, the majority of men said that they would take time off work if they were experiencing physical symptoms such as unexplained chest pains, blood in their urine/stools, or if they were to find a lump. However, less than 1 in 5 men said that they would do the same if they were experiencing anxiety (19%) or if they were feeling low (15%). On top of this, more than three-quarters of men who took part in The Government National Well-being Survey reported significantly lower life satisfaction than women. 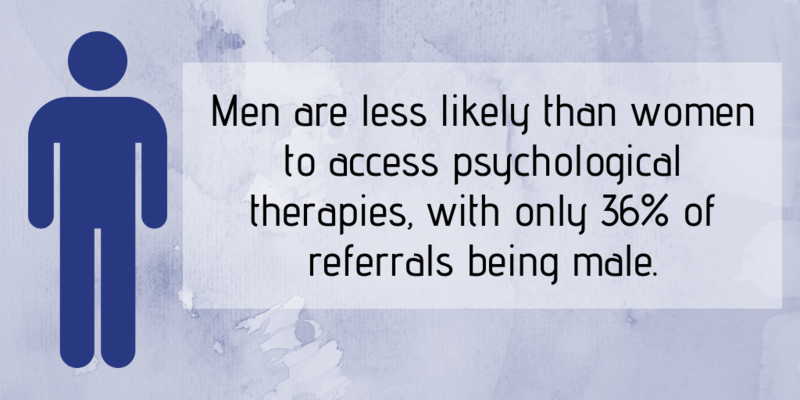 Men are less likely to act on the warning signs of mental distress and may be unable or unwilling to ask for help and support from mental health services. As a result, many men tend to turn to self-management strategies which may be more damaging to themselves as well as to those around them. These strategies may include taking drugs or consuming alcohol on a regular basis. Please remember that mental health conditions can affect anyone at any stage of their lives, no matter their gender, age or background. Mental health is just as important as physical health and is nothing to be ashamed of. If you are suffering please seek the help that you need and deserve! There will always be someone there to support you, there will always be someone who cares about you! Having a mental health condition does not make you weak, it does not make you any less of a man, it is a serious health condition and you should not have to deal with that alone. Reach out to your friends, family and those you trust, speak with your GP and mental health professionals and do not be ashamed. You are stronger than you think.